Musics, beat off! Oh, grow up! Sorry, not to be crude, but that is the official command once a tune has been given prior to marching to the beat, is to beat off. It never fails at a reenactment to hear titters of laughter in the background and it may have elicited like responses back then. The command sequence going something like this: prior to parade and assembly of the companies in the company streets the Adjutant or the Colonel would give the command for the start of parade and trooping the colors (color guard with national and regimental standards assembled to give honors) whereas the drum corps would follow “Musicians, beat off!” and begin the drum and fife to morning parade. For a nice discussion of the use of these calls see The Authentic Campaigner: Drill vs Assembly. Note the lack of uniformity. We put more emphasis on being uniform today than the volunteer units did in the war; perhaps less than the regular army did at the same time. Only a few of these men and boys are wearing the regulation musicians uniform for whatever reason; original issue was disposed of and only thing on hand at the quarter master was the regulation sack coat (according to regulations, musicians were relieved from fatigue duty save for normal mess duty), regulation uniform coat is lost and only the sack coat is available, the soldier was mustered as an infantryman but is able to play a fife or the drums and is assigned to the drum corps, any one of these could be a valid reason for the disparity of uniformness. 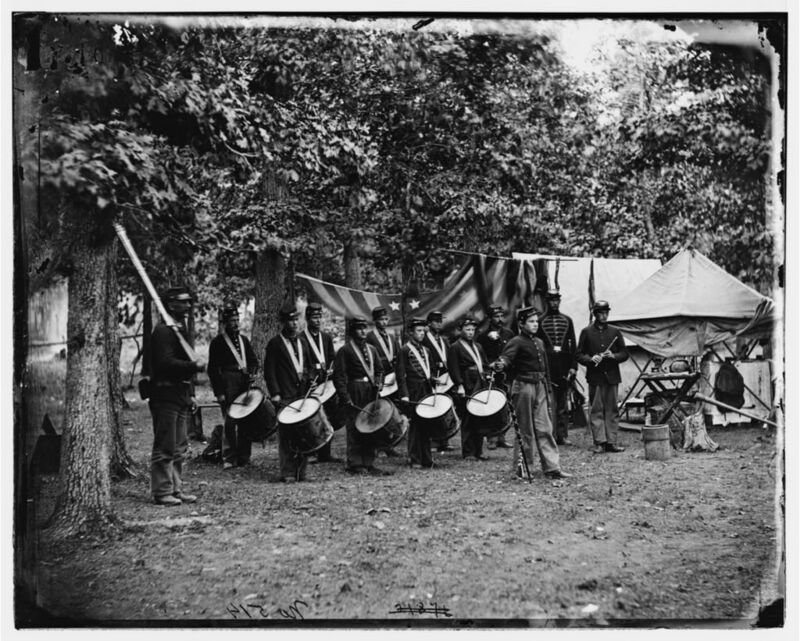 These are men from the 93rd NY, (see earlier post of the 93rd NY) and a few of these drummers are wearing the frock coat that I surmised was a hold over or part of clothing issued by the State of New York to its volunteers. It is hard for us sometimes to get out of our heads as we evaluate living history displays and look at uniforms and not make judgements based on modern military doctrine and discipline. But, there are areas of study that are so esoteric, as in the quarter master returns for specific units, to give us an operating idea of why federal regiments had so much variety in uniform use that they are seldom if ever brought to light. We are used to seeing this in the Confederate ranks. As images like these come to light we can get a better glimpse of daily life of the Federal soldier. There is also a stereotype of the drummer boy and here we see several younger boys but they are the minority as there are also grown men in evidence. It is no easy feat to drum a cadence call and these men would have been doing plenty of it on a daily basis. The need for a regimented life driven by drum rolls and bugle calls meant these men were constantly in use. Every military call required a drum cadence and bugle: sick call, morning formation, parade, drill, fatigue, etc. These men were professionals at what they did and the requirement to have some skill at it would mean a selection process that demanded skill. As a reenactor, I’ve witnessed poor cadence performed by someone’s son who is dressed up in uniform and given a drum. If you’ve ever tried marching to two or more who aren’t keeping the cadence very well it is maddening. These boys who are present aren’t just there because father or brothers are there, they have skill. The last thing I wanted to point out was the drum major, who looks not so much older than some of his drummers. His uniform is not regulation for musicians but looks to be a bit more tailored for his role, something only seen with officers who were allowed to purchase their own uniforms. The shell jacket is a nice touch, cut with a sash and a belt and buckle that looks like a standard NCO buckle (rectangular instead of oblong) but it is a little hard to discern. The thing in his hand is called a Mace and the design of it hasn’t changed at all in the last 150 years. The drum major uses the mace for two things: for command and control and for flourishes while on parade and the march. The drum corps proceeds the regiment when on parade and while on the march with the drum major in the front of it leading the way. The Mace is used to communicate starts and stops in the music, positions of attention, starts and stops while on the march, and while the group is playing to give martial flourishes. A really good drum major will put on quite a show when on parade. Using the Mace is another skill that is enhanced by the ability of the drum major and no two will use it exactly alike in the flourishes. All commands, when used with the Mace, are unspoken and a good drum corps does not need verbal commands to execute any movement. Watch this YouTube video to see how the Mace is used for both command and for music direction. This is 1 really interesting post. I like the way you write and I will bookmark your blog to my favorites. Previous Previous post: Band box, paper collar soldiers; literally.